This was our second time staying in Lacey's Lodge. The location is great and there is plenty of room for a large family. The pool table has been replaced since our last visit. My only complaint is one of the sofa's feels like it's dumping you out in the floor. Our stay was great and we were there for 4 nights. I truly enjoyed my experience with this rental group and will definitely be using them again. The staff was very friendly and the check-in/check-out process was super easy. they gave a curiosity call to see how everything in cabin was. First time staying in a cabin with our children and grandchildren, we were very pleased! The cabin was cozy and a home atmosphere. All enjoyed the pool table and fireplace. The beds were very comfortable. The staff was excellent! We would book again with CABINSUSA! First let me say that Lacey's Lodge was absolutely beautiful. But I do have a couple of things that I would like to address. First we were in the middle of cooking dinner the first night we got there and the propane ran out. Ok that happens. Gratefully the staff was very accommodating and got us a new bottle very quickly. Then the kitchen sink handle was broken. The staff that brought us the propane was able to fix it quickly right then. For the amount of money that we paid for the cabin I did expect that the pool table to be in better condition (the felt was all torn up), there was a knob missing from the jacuzzi tub and the space heater in the master bedroom wasn't working properly. The biggest concern we had was the floor vent grates that weren't flush with the floor and if anyone were to hit it just right they could have hurt themselves very badly. Thankfully no one in our party did. A minor issue was the grill out back. It was very dirty. You all should make sure that the grill is cleaned for the next guest. We paid a lot of money for you to clean the cabin. It should be clean. I have pictures of the pool table, tub and the grill. IF you so choose to see what I'm talking about. Thank you for your time. Thank you for taking the time to leave a review, Jeffrey! We take great pride in our cabins here at Cabins USA and we as a company as well as the individual cabin owners, greatly appreciate the feedback! We always encourage guests to let know if any issues arise during their stay so that we can quickly resolve them. We are glad to hear that our 24/7 Maintenance technicians were able to quickly and effectively address the issues you found. The owners have installed a new pool table since your stay. We hope that you will come back and stay with us again in the near future! Thank you for choosing Cabins USA! Annual trip to Pigeon Forge with Family, for 2018. Laceys Lodge is very conivenent to the strip and very accommodating for a large family. Although there were some issues found with the cabin and they have been relayed to the management staff. They responded very quickly and advised they would be addressed as soon as possible. I look forward to staying with cabins USA in the future. Sincerely Deborah Reeves and Family. This was not our first visit to the Smokies, however, it was our best vacation. The location and spaciousness of this cabin provided us loads of fun. The shallow creek across the street from the cabin was a big hit with our young children while the hot tub and pool table kept our older boys occupied. We planned a spontaneous getaway and had limited options. Typically, we’d look for a more luxurious cabin but settled with Lacey’s Lodge because of location and availablity. Needless to say, we will return. Being within 3/10 minuets from most larger attractions and a few amenities made every minute of our trip enjoyable. Staff responded promptly when I called for any issues. There is lots of space and very nice. The only thing is the furniture needs to be updated. The pullout beds are not comfortable and you can feel the springs in your back and the dryer took multiple cycles to dry. Other than that this is a great cabin and close to town but out far enough where you don’t hear any city noise. I would stay here again. This cabin had a great location, not a great view. Front porch view was a old barn and construction site. The cabin had a musty smell when you came in each time but once you are there awhile you do not notice it. One room did not have a mini blind so we had to put a sheet over the window at night. All of these things were minor issues for us. The beds were comfortable. The cabin had a lot of nice living area space and overall was a good cabin. We loved Lacey’s Lodge and how close it is to town. Also the fact we didn’t have to travel up steep roads to get to it. The only recommendations I would suggest would be update to 2 pull-out sofa beds because they are outdated and also putting up a new blind at the sliding door. Also the blind in the first bedroom(to the right)off the kitchen could use a blind that fit better because it fell while we were there which was no big deal we just put a blanket up to cover it. We don’t play pool much but if someone really was into it,the cover on the pool table might be an issue but it didn’t bother us. Overall we loved our stay and would stay in Lacey’s Lodge again!! Great location, spacious and roomy. We had a problem with the fireplace, but was taken care of quickly. We enjoyed our stay and will stay with Cabins USA again as we have many times before. Really enjoyed our stay and the location. Beautiful site and so peaceful. .........Needs a blind put up in living room and new blinds on patio door. Patio door blind panels kept falling down with the slightest bump. I had a blood stain on my covers than I got in the hot tube and got out with small bumps on my upper legs. Really enjoyed this cabin. Lots of room for our family and not feeling crowded. Close to everything, just right off the parkway. The only complaint is the pool table needs to be recovered. Other than that I would recommend this cabin for anyone wanting a nice place to stay with family. Thank you for taking the time to let us know about your recent stay in Lacey's Lodge! We here at Cabins USA work hard to make sure each of our guests have the best stay possible while vacationing in the Smokies. Thank you for letting us know about the condition of the pool table. Your comments have been forwarded to our Owner Liaisons and they will be bringing this to the owner's attention. Thank you for choosing Cabins USA and we look forward to having you as our guest again! This was a nice cabin in a great location. Our family really enjoyed the spaciousness of the cabin for our family of 9. It was also close into town so we could run to the store if we needed to but also not right on the main roads so it was private and quiet. We will definitely stay at Lacey's Lodge again. Thank you for taking the time to let us know about your recent stay in Lacey's Lodge! We here at Cabins USA work hard to make sure each of our guests have the best stay possible while vacationing in the Smokies. When you are ready to stay with us again, please mention you are a return guest for an additional discount. Thank you again for your review and thank you for choosing Cabins USA! My family and I come to Pigeon Forge for the Annual Car shows every September for our mini fall vacation. We always choose Cabins USA for our getaway needs. Each year we choose a different cabin hoping to find the perfect one. 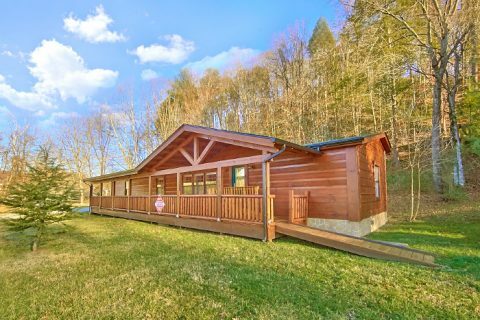 Lacys Lodge is the perfect cabin for this time of the year. It is a huge ranch with plenty of room located less than a mile from the strip!!! We will definitely reserve this cabin again for next year. One suggestion....The bedrooms need overhead fans in each to circulate the air. Thank you Cabins USA for the perfect getaway!!! Thank you for all of your kind words and for continuing to choose Cabins USA when you visit the Smokies! We work hard to make sure each of our guests have the same great stay you enjoy. Thank you for your suggestion of the ceiling fans. Your comments was forwarded to our Owner Liaisons and the owner has added a ceiling fan to the Master bedroom. Thank you again for choosing Cabins USA and we look forward to having you as our guest again! We enjoyed our time at Lacey's Lodge. We really liked the location being just off the parkway. Thank you for taking the time to let us know about your recent stay in Lacy's Lodge! When you are ready to stay with us again, please mention you are a return guest for an additional discount. Thank you again for choosing Cabins USA and we look forward to having you as our guest again! Loved the spacious cabin. Loved the woodwork. The location was perfect for our needs and interests. Please note: the ramp off the front porch should really face the driveway vs. the lumpy lawn. Or perhaps create a 2nd parking spot by the end of the ramp. The cabin is very handicapped friendly except for that one feature. We did have a problem with tiny ants in the dining area (and on the dining table!). Also, the pool table surface needs repair and one couch should probably be replaced soon. Thank you for taking the time to let us know about your recent stay in Lacey's Lodge! We here at Cabins USA work hard to make sure each of our guests have the best stay possible while vacationing in the Smokies. Thank you for your suggestion regarding the ramp. That has been forwarded to our Owner Liaisons. They will bring that to the owner's attention. When you are ready to stay with us again, please mention you are a return guest for an additional discount. Thank you for choosing Cabins USA and we look forward to having you as our guest again! Very nice place. We enjoyed our stay. However when we arrived there were 3 remotes to tvs that contained no batteries. The fireplace would not light. We called repair guy came by and got it lit. It stayed lit for about 3 minutes and went out again. He came back stated that the thermo coupler was bad. It would take him about 4 hours to replace it. It was already 10pm so we opted to turn the gas off to the fireplace. Thank you for taking the time to let us know about your recent stay in Lacey's Lodge! We here at Cabins USA work hard to make sure that each of our guests have a pleasant stay while visiting the Smokies. I apologize for the issues you experienced during your stay. Maintenance has been working to correct those issues. Thank you again for your review and thank you for choosing Cabins USA! Couldn't ask for a better location! It is just seconds off the strip. I would recommend this cabin to those with a party of 8 to 10. We loved the pool table and hot tub, but it was the location that will bring us back. We enjoyed our stay at Lacey's Lodge sooo much that the next time we decide to vacation in Gatlinburg. We will book the same cabin. It were in a great location, not far up in the mountains were its hard to find. And Cabin USA we could not say enough greatness about. What they told us is what we got. Thank you again Cabin USA.for making our vacation so wonderful. We will definitely make reservations with you again. Thank you for taking the time to let us know about your recent stay in Lacey's Lodge! We work hard to make sure that each of our guests have the same great stay you enjoyed while vacationing in the Smokies. When you are ready to stay with us again, please let our reservationists know you are a return guest for an additional discount. Thank you again for your review and we look forward to seeing you again soon! Our stay was nice but the air wasn't working to good in the master bedroom nor the living room plus the sliding door had half of the blind missing and the light on the jacuzzi wouldn't come on. Very nice family space. We loved our stay here fit our needs very well. Close to the strip yet a quiet country feel. I highly recommend this cabin to others. Not super high class yet very nice a roomy. Had a blast the week we were here. Very large and clean house. The only minus we had were some ants and spiders in the house, which is to be expected when the house is so close to the wood line. Also an extra light on the front porch would be helpful when trying to enter the code on the lock at night. Perfect location to all the area attractions, but far enough off the main road to have a quite nights sleep. Thank you for letting us know about your recent stay in Lacey's Lodge! Our housekeepers work hard to make sure that each of our cabins are thoroughly cleaned and fully stocked so all you have to do is walk into your cabin and start relaxing. I apologize for the insect issues you experienced. Maintenance has been notified and will be working to correct that issue. Thank you again for your review and we look forward to having you as our guest again! Front porch was very dark. Only one key and it went to front door. Would recommend a key to side door where you park and it is lit up. Love that it is one level and can't beat the location. Will defiantly request this property again. Thank you for your review. We appreciate your feedback on your stay, and we hope that we will hear from you again soon. Do not forget to call about our return guest discount.